This night-side photo of Titan taken by the Cassini spacecraft shows a buildup of haze over the Saturn moon's south pole (bottom). Cassini has found a build up of haze over the south pole (bottom). New results from Cassini's infrared spectrometer show that air is now sinking at the south pole, leading to increased temperatures at high altitude and a large enrichment in trace gases. Image released Nov. 28, 2012. 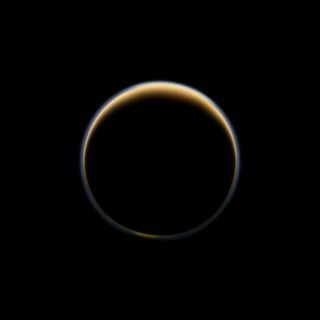 Saturn's cloudy moon Titan has a middle atmosphere containing organic compounds that could hold the potential for life. Now, a new look at that atmospheric layer by a NASA spacecraft shows that it may be on the move, scientists say. New measurements from NASA's Cassini spacecraft orbiting Saturn show that the seasonal movement of the trace atmospheric gases on Titan rises to higher altitudes than expected, researchers said. Because of Titan's seasonal orientation, the winter poles always point away from Earth, hiding on the moon's dark side. Studying the complex trace gases in the visible summer hemisphere doesn't solve the problem; water vapor in Earth's atmosphere obscures the measurements of the trace gases. "We had to wait for Cassini to arrive, and then for it to take a long enough series of data to see the changes happen." This day-side photo of Titan taken by the Cassini spacecraft shows a buildup of haze over the Saturn moon's south pole (bottom). Cassini has found a build up of haze over the south pole (bottom). New results from Cassini's infrared spectrometer show that air is now sinking at the south pole, leading to increased temperatures at high altitude and a large enrichment in trace gases. Image released Nov. 28, 2012. Most planets are tilted in respect to the plane of the solar system, with one pole pointed toward the sun at a time. As the planet — or in this case, moon — circles the star, the poles gradually trade places, giving rise to the seasons. Saturn distance from the sun is nearly 10 times as far from the sun as the Earth, so 29.5 Earth-years pass each time Titan completes an orbit. Seasons on the distant moon last seven years. Titan celebrated its northern spring equinox on Aug. 11, 2009. Working with an international team, Teanby examined Cassini's observations of the southern hemisphere of the moon for two years before and after, as fall turned into winter. As the seasons shifted, the circulation in the atmosphere changed as well, which wasn't unexpected. What surprised the scientists was just how far some of the components traveled. Cassini revealed an increase in trace gases such as hydrogen cyanide, a rich hydrocarbon from the upper atmosphere. Heat from the summer sun in the northern atmosphere, combined with winter cooling in the southern, caused shifts in temperature and pressure that moved the trace gases down through the atmosphere. By using Cassini's Composite Infrared Spectrometer, the scientists were able to track the circulation of the gases. They found that, rather than reaching to a height of 310 miles (500 kilometers), the middle atmosphere extended an additional 60 miles (100 km). According to Teanby, the research demonstrates that heat from the sun is sufficient to drive circulation to altitudes higher than previously suspected. The findings of the new study were published online today (Nov. 28) in the journal Nature. Cassini has launched toward Saturn in 1997 and has orbited the ringed planet since 2004. It is expected to continue its observations until 2017. The only moon with more than a trace of an atmosphere, and the only body other than Earth with a nitrogen-rich atmosphere, Titan is considered by many scientists to be one of the best sources to host potential life in the solar system. The hydrocarbon haze in its middle atmosphere plays a huge role in this potential as it rains the building blocks of life onto the surface, a process that could be enhanced by improved atmospheric circulation. "Enriched organic condensates rained out at the south pole would provide more raw materials for further complex molecules to form on the surface," Teanby said. The haze also influences the moon's atmosphere, absorbing heat from the sun and causing a temperature structure similar to Earth, though much colder. Sunlight illuminates the haze, which lies at what was considered the top of the middle atmosphere, giving it what Teanby calls "a faint eerie glow" at the otherwise dark south pole. The upward extension of the middle atmosphere also implies that the potentially life-giving haze may have another source than scientists have suspected, he said. The team studied the changes in the south pole only, but expect to see similar behavior in the north pole following the southern spring equinox. "We need to wait another 15 years to confirm this," Teanby said.